We discovered the persimmon tree in September when we noticed the golden orbs hanging from the branches. We hadn’t paid attention to the tree before because it was in a relatively inaccessible area behind our house and we had no idea what it was or what if anything it would produce, it had not set fruit until this year. When we found the fruit, we realized it was American persimmon (aka common persimmon and Eastern persimmon), which is a berry in botanic terms. The fruit is small, ranging 1 to 1-1/2 inches (2.5 to 4 cm) in diameter and very sweet when ripe. Persimmons are autumn fruits that can hang on even after frost, and you can wait until after frost to gather them to ensure they are fully ripe. 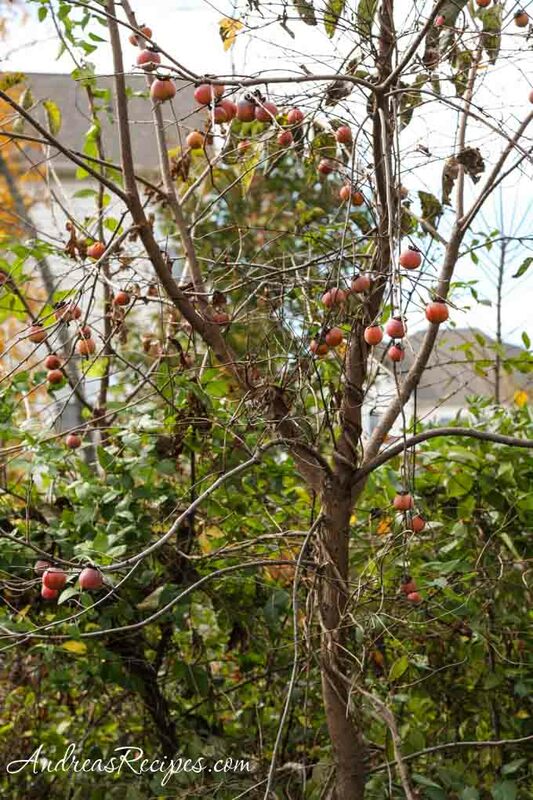 The leaves start to droop and fall off the tree as the fruit ripens. The persimmons should be very soft and even a little wrinkled before eating, otherwise they’ll have a chalky taste. If the fruit starts to drop when you shake the tree, they are pretty much ready. The tree we found is in a wild, untamed area surrounded by thistles, climbing vines, and poison ivy, and we also had to watch for snakes as we carefully made our way to it. There are actually three persimmon trees back there, all about the same size and one without fruit so it’s probably the male tree. Persimmon trees are either male or female and the female trees bear fruit. Unlike some fruit trees, persimmon seeds produce trees that are true to the mother tree and the trees grow wild and prolifically. 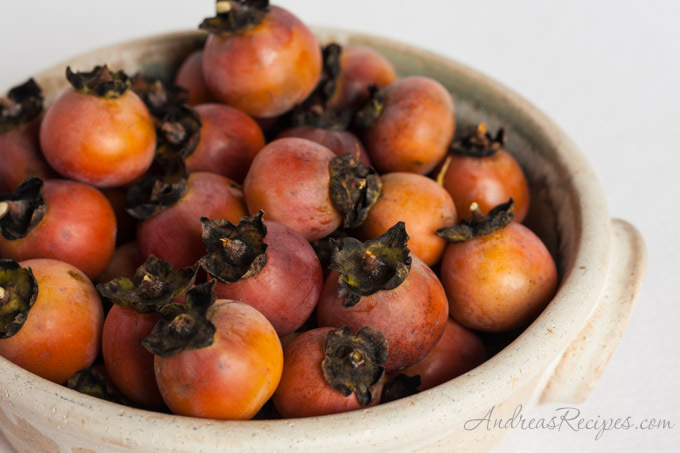 The birds were already picking at the fruit near the top of the tree, so we knew it was time to gather persimmons. They taste sweet, almost like honey, and the flavor came through in this spiced cake. 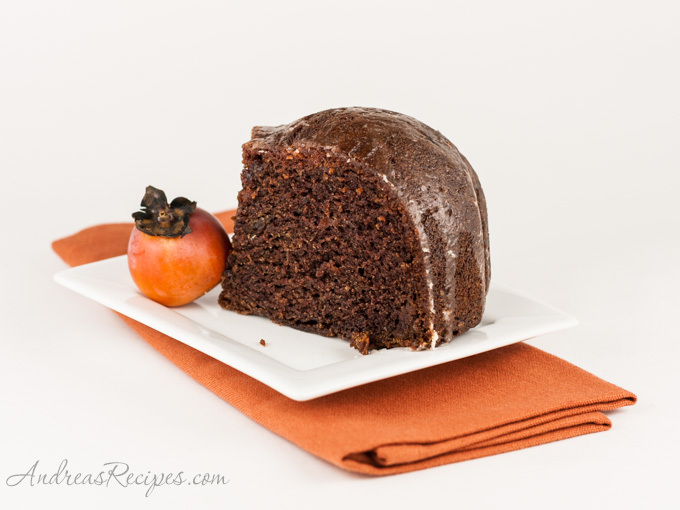 Except for the time it takes to press the persimmons, the cake is relatively easy to make. The thin lemon glaze is optional, Michael doesn’t care for it but I like the bright flavor and bit of crunch it adds. 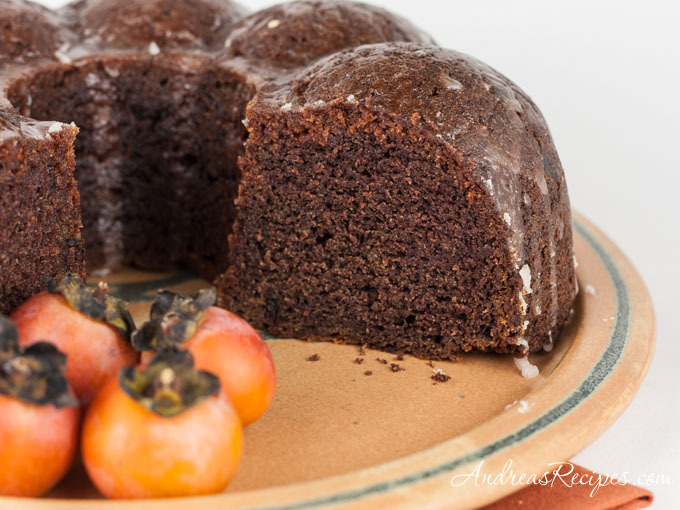 You can use other types of persimmons, such as Hachiya or Fuyu for this cake, but since those are larger you will use fewer fruits to get the same amount of puree. Preheat the oven to 325° F/165° C. Set rack in the middle of the oven. In the bowl of the stand mixer, cream the butter and sugar until it it light and fluffy. Add the eggs, one at a time, beating well each time. Add the persimmon puree and vanilla extract, and mix well. In the medium bowl, sift together the flour, cinnamon, nutmeg, and baking soda. Add to the butter mixture and stir gently, tossing in the chopped dates. Do not overmix. Pour the batter into the prepared pan. Bake for 60 to 75 minutes, checking every 5 minutes after 1 hour has passed. When a tester comes out dry with just a few crumbs clinging, remove the pan from the oven. If the tester has no crumbs the cake will be dry. Cool the cake in the pan for 15 minutes, then turn the cake out onto a wire rack and cool completely. MAKE THE GLAZE: While the cake is cooling, whisk together the the powdered sugar and lemon juice until the glaze is smooth. Pour the glaze over the cake while warm. Allow to cool completely, then slice and serve. ummm! I love persimmon cakes. I have a recipe from a while back on my blog too. what i love about this is that tangy glaze. Wow, I’ve never seen such a small persimmon before! The cake looks perfect for Fall. Delicious looking cake! Do you think I could use a food mill to make the puree? What a treat it must have been to find a persimmon tree behind your house. You clearly make the most of the treasure with this recipe. Hi Jennifer. The tree had just enough fruit for the cake, and we hope the trees will produce even more as they age. It will be fun to come up with more ways to use the persimmons. Wow, I’ve never seen wild persimmons before. When ripe are they hard and crunchy like fuyus? Or are they slurry-like inside like hachiyas? Hi Elise. This type of persimmon is common throughout the Eastern seaboard and into parts of the midwest and Gulf Coast. They get very soft and the skin just slips off when ripe. Oh my Andrea, those photos look unreal! Those little wild persimmons are so cute! I didn’t realize they grew on the east coast. Lucky you to have them in your own yard, yet! The Fuyu persimmons are hard and crunchy..to be eaten like an apple. I don’t think they soften..they just drop and rot when overripe. Our neighbor has a tree full that partially hangs over our back fence. Lucky me! I have one recipe that uses them in a cake, but they are cubed and added,. I guess you could puree them if you cooked them first. Not sure about that though. Your cake looks lucious, I’ll have to actually buy some hachiyas and make it. Thanks for this! Hi Susan. Yes, the the Fuyu persimmons could be cooked a bit and mashed before using. The puree forms a good bit of the liquid for the cake, so I don’t think I would use them just cubed. 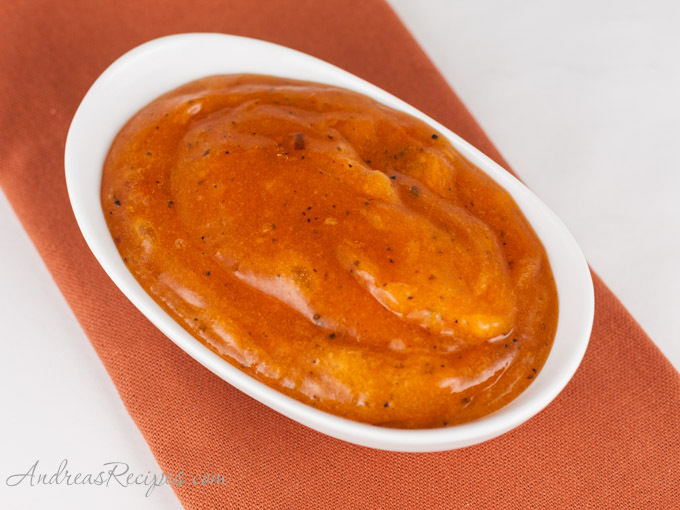 I love the look of the persimmon puree (and the color is so seductive). Now I’m thinking of other ways to use it. This post inspired me to try cooking some other things with persimmons, so I put them in a few savory dishes. Thanks for the inspiration! I love baking with persimmons. And they’re perfect with dates. Have you ever froze this cake? I would like to but not sure about when to put on the glaze. Thanks, this recipe sounds yummy. Hi Sharon. I have not frozen this cake, it never seems to last long enough. That being said, you can certainly freeze it, though I think I would wait until it’s thawed before adding the glaze. Hope you enjoy it! i veganized this cake very easily and it was THE most amazing cake i have ever had. Hi there, Just wondering – 3 cups of flour did not equal 240g for me. 2 cups = 240g? I did the recipe based on 240g and the mixture and finished product seemed quite wet. Overall lovely flavour though. Can you please clarify flour qtys? Thanks! Hi Aimee. You are correct, there was a typo in the metric conversion for the flour, I’m so sorry about that. I’ve corrected the recipe. Thanks for letting me know! Andrea – I made this cake recently and it was sensationally delicious. I hope you don’t mind my posting your recipe on my blog (giving you credit of course).